Two bears were caught on camera playing with a flagstick on the 7th green at Moose Run Golf Course near Anchorage Alaska. 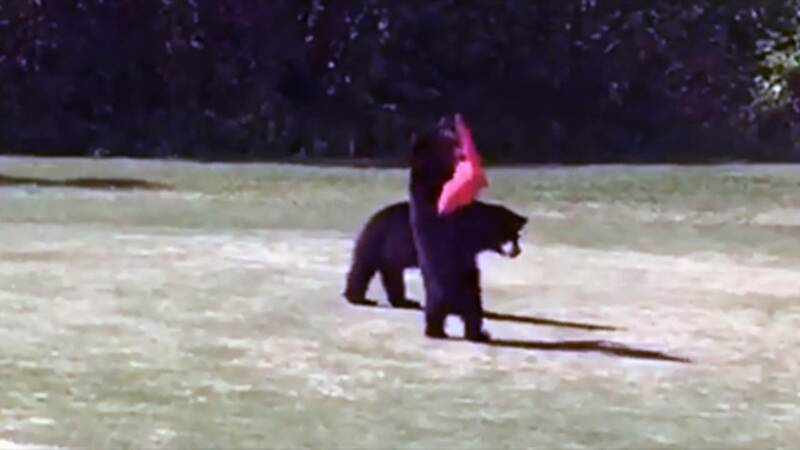 ANCHORAGE, Alaska - A golfer received a big surprise when he discovered two bears playing roughly with a flagstick at an Alaska golf course. Trevor Stefan told the Anchorage Daily News that he arrived at the green on the 7th hole at the Moose Run Golf Course to see a bear cub wrestling with the flag before two of its siblings arrived. He said the three bears then began to wrestle with each other and the pole until the flag fell from the top of the stick. One of the bears then made off with the flag. Trevor told the newspaper he watched the bears for some time but left when one of them ran toward him. "I've never seen them playing around like that before," Stefan said. "It was pretty funny." Trevor's mother Alissa Stefan posted the video to Facebook.